My name is John Bocchino, and I go by John or Bo. I am a fly fishing manager and guide, and I live in Ridgway, Colorado. I arrived in Colorado in early 2006, when I came to work for one of the top resorts in the Gunnison Valley. I managed the fly shop and guide service there for five seasons and guided for eight seasons, prior to starting up my own fly fishing outfitting business and working for myself for a couple of years. I currently work for Eleven, headquartered in Crested Butte. In my role as Colorado Fishing Manager, I manage the Colorado Angling program and run fly fishing operations based out of Taylor River Lodge. Fly fishing is my passion, and I spend as much time on the water as possible. This part of the Rocky Mountains is home to some of the best trout rivers in the country, and there are countless opportunities to fly fish on a variety of water in the area. I am a life member of Trout Unlimited (TU), and fully support the TU mission to conserve, protect and restore North America’s coldwater fisheries and their watersheds. 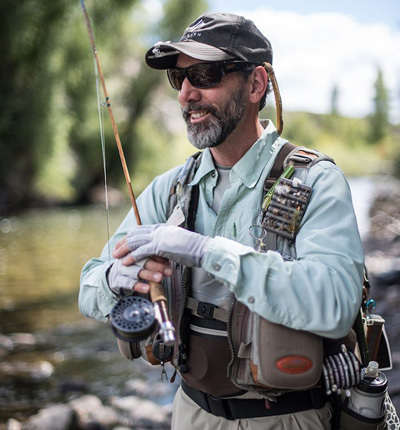 Prior to pursuing a career in the fly fishing industry, I spent 25 years in telecommunications, information technology, engineering and consulting. My business experience is extensive and has varied over the years. I worked for multi-national corporations with operations around the globe and was fortunate enough to be able to travel around the US, Canada, Europe, and Hong Kong and China.